Here I go again with another production at the Ordway Center for Performing Arts -- see what I did there? The Ordway is opening their 2018-2019 season with an Ordway original with Mamma Mia! and what a perfect time to open this sequin filled production but on the same weekend when the movie Mamma Mia 2 opens in theaters. It's almost like it was meant to be! There is a lot of love for this ABBA inspired jukebox musical - a term used for a musical featuring songs from a popular band, group or singer - but there is also a lot of annoyance too. For some reason there are a lot of Broadway and Theatre fans who just don't like it. Some say it's not deep enough and it's too simple but I couldn't disagree more. This is a perfect example of a show that is just plain fun and entertaining. It's the eve of Sophie Sheridans wedding on a beautiful island in Greece. As she prepares for it there is one task that is left undone and that's discovering the identity of her father. She's grown up with her single mother, Donna, who owns a hotel on the island and has faithfully and proudly raised her daughter and shielding her from the truth on who her father is. Sophie discovers her mothers diary from the year she was born and realizes she's found a clue to who her father is...but it could be any one of three men (Sam, Harry, and Bill). Unsuspecting to her mother, she invites the three men to her wedding in hopes she will discover who her real father is. Upon arriving to my seat I'm already in awe at the gorgeous and stunning set that scenic designer Rick Polenek has designed. The set really does transport you to a beautiful island where flowers bloom and the waves crash against the coast. The use of projection on the screen to simulate waves brought a new depth to the set. It helped heighten it but I appreciated that the set didn't rely on it. I'm a stickler about the use of projections on a set but I felt this one was well used. The set is complimented again by the fabulous costumes, designed by Mary Beth Gagner. Whether they are wearing casual beach wear or disco themed sequin jump suits, they were fabulously done and left me wanting one for myself! 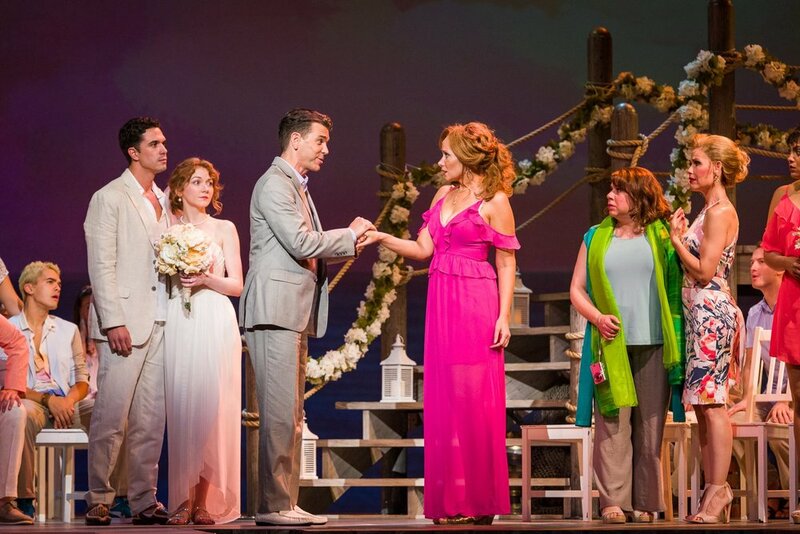 This specific production of Mamma Mia is an Ordway Original meaning a lot of the cast is local, which I love. The Twin Cities is nothing short of immense talent and casting director Reid Harmsen has tapped into it perfectly. It's the perfect show to remind the Twin Cities how rich we are in talent. Starting with the ensemble, I have to take the time to discuss how utterly fabulous they were. Whether they were scurrying across the stage in full scuba gear or dancing the night away singing "Gimmie! Gimmie! Gimmie! (A Man After Midnight)," they were on fire. The choreography by Mitch Sebastian was wonderfully executed as well. During "Money, Money Money," the whole ensemble brought the house down as they performed in perfect unison to a variety of vogue inspired moves. All I need was for one of the cast members to death drop when the beat dropped. This is a big show cast wise. The ensemble is pretty large and there are a variety of leads who all have their "moment" on stage. Christine Sherrill plays Donna Sheridan and knows how to pull raw emotion out of a song whether it's happy or sad. Her stamina is unbelievable as well after flawlessly singing "Slipping Through My Fingers" she still managed to blow me away as she almost immediately went into the biggest ballad in the show, "The Winner Takes It All." Caroline Innerbichler plays Sophie Sheridan and plays the role with such innocence that is elevated by her dazzling singing voice. Dieter Bierbrauer, who plays Sam Carmichael, is perfectly cast and harmonizes beautifully with Sherrill in "SOS." Patrick Connaghan plays Sophie's fiance, Sky, and is so charming in scenes with Innerbichler whether he was complimenting her beauty or showing raw passion in numbers like "Lay All Your Love On Me." While all the leads were incredible, I've got to say that the dynamic duo that Erin Schwab and Ann Michels created were gold. Their comedic moments together and a part were the highlight of the show for me. Get these two their own cabaret show cause I'd buy tickets in a heartbeat! Michels, who plays Tanya, is incredible no matter what number she's in including "Does Your Mother Know?" which was a show stopping hit. Schwab is incredible as Rosie and is a big reason why I would see it again. Her comedic timing plays so well off a variety of the other characters, including Michels as Tanya. Schwab's not only comedic but a wonderful singer in numbers like "Chiquitita" and "Take a Chance." I've seen a lot of shows, especially in the last two years. I always am entertained however it's been awhile since I've had fun at a show. This is the show that broke that streak. I genuinely had fun watching this show and tapping my foot to the beat of the tambourine. I grew up on ABBA music, thankfully both my parents have great taste in music, so it was great getting to experience the music in a new way and also with the person who introduced it to me, my mother. It was nostagalic and also brought an overwhelming amount of joy. 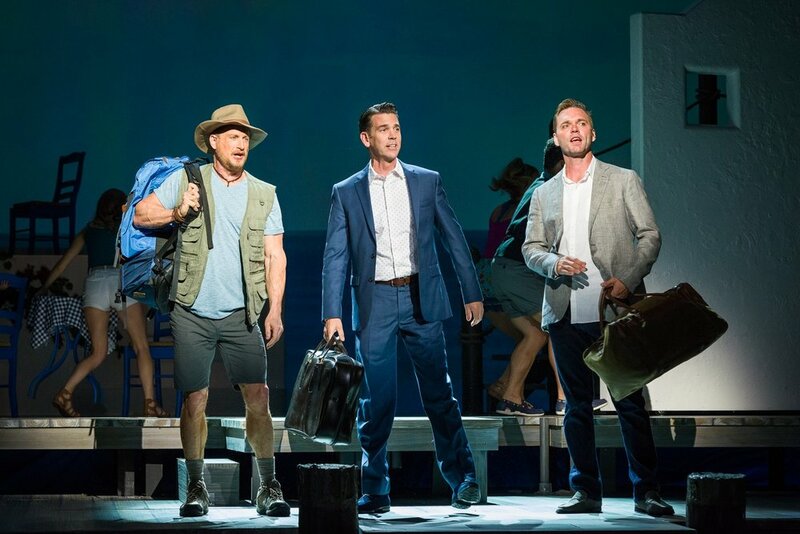 Mamma Mia plays at the Ordway Center for Performing Arts in St. Paul now through August 5.